In the early days of quantum physics, in an attempt to explain the wavelike behavior of quantum particles, the French physicist Louis de Broglie proposed what he called a "pilot wave" theory. According to de Broglie, moving particles—such as electrons, or the photons in a beam of light—are borne along on waves of some type, like driftwood on a tide. Physicists' inability to detect de Broglie's posited waves led them, for the most part, to abandon pilot-wave theory. Recently, however, a real pilot-wave system has been discovered, in which a drop of fluid bounces across a vibrating fluid bath, propelled by waves produced by its own collisions. In 2006, Yves Couder and Emmanuel Fort, physicists at Université Paris Diderot, used this system to reproduce one of the most famous experiments in quantum physics: the so-called "double-slit" experiment, in which particles are fired at a screen through a barrier with two holes in it. In the latest issue of the journal Physical Review E (PRE), a team of MIT researchers, in collaboration with Couder and his colleagues, report that they have produced the fluidic analogue of another classic quantum experiment, in which electrons are confined to a circular "corral" by a ring of ions. In the new experiments, bouncing drops of fluid mimicked the electrons' statistical behavior with remarkable accuracy. "This hydrodynamic system is subtle, and extraordinarily rich in terms of mathematical modeling," says John Bush, a professor of applied mathematics at MIT and corresponding author on the new paper. "It's the first pilot-wave system discovered and gives insight into how rational quantum dynamics might work, were such a thing to exist." Joining Bush on the PRE paper are lead author Daniel Harris, a graduate student in mathematics at MIT; Couder and Fort; and Julien Moukhtar, also of Université Paris Diderot. In a separate pair of papers, appearing this month in the Journal of Fluid Mechanics, Bush and Jan Molacek, another MIT graduate student in mathematics, explain the fluid mechanics that underlie the system's behavior. The double-slit experiment is seminal because it offers the clearest demonstration of wave-particle duality: As the theoretical physicist Richard Feynman once put it, "Any other situation in quantum mechanics, it turns out, can always be explained by saying, 'You remember the case of the experiment with the two holes? It's the same thing.'" If a wave traveling on the surface of water strikes a barrier with two slits in it, two waves will emerge on the other side. Where the crests of those waves intersect, they form a larger wave; where a crest intersects with a trough, the fluid is still. A bank of pressure sensors struck by the waves would register an "interference pattern"—a series of alternating light and dark bands indicating where the waves reinforced or canceled each other. Photons fired through a screen with two holes in it produce a similar interference pattern—even when they're fired one at a time. That's wave-particle duality: the mathematics of wave mechanics explains the statistical behavior of moving particles. The statistical description of the droplet's location is analogous to that of an electron confined to a circular quantum corral and has a similar, wavelike form. "It's a great result," says Paul Milewski, a math professor at the University of Bath, in England, who specializes in fluid mechanics. "Given the number of quantum-mechanical analogues of this mechanical system already shown, it's not an enormous surprise that the corral experiment also behaves like quantum mechanics. But they've done an amazingly careful job, because it takes very accurate measurements over a very long time of this droplet bouncing to get this probability distribution." "If you have a system that is deterministic and is what we call in the business 'chaotic,' or sensitive to initial conditions, sensitive to perturbations, then it can behave probabilistically," Milewski continues. "Experiments like this weren't available to the giants of quantum mechanics. They also didn't know anything about chaos. Suppose these guys—who were puzzled by why the world behaves in this strange probabilistic way—actually had access to experiments like this and had the knowledge of chaos, would they have come up with an equivalent, deterministic theory of quantum mechanics, which is not the current one? That's what I find exciting from the quantum perspective." Physicists' inability to detect de Broglie's posited waves led them, for the most part, to abandon pilot-wave theory. Recently, however, a real pilot-wave system has been discovered, in which a drop of fluid bounces across a vibrating fluid bath, propelled by waves produced by its own collisions. I think this statement is misleading. What they found was a physical analogy, not that the qm wavefunction is an observable entity in itself physically guiding a 'particle'. It's not. It is pointless imo to construct such 'epicycles'**, unless you can physically observe the 'epicycle'. ** I mean here a redundant and imagined physical device for purposes of intuitive explanation. That is not the role of physics at the qm scale. Experiments like this weren't available to the giants of quantum mechanics. They also didn't know anything about chaos. Suppose these guys—who were puzzled by why the world behaves in this strange probabilistic way—actually had access to experiments like this and had the knowledge of chaos, would they have come up with an equivalent, deterministic theory of quantum mechanics, which is not the current one? Wouldn't have made a difference, nor would constructing a model out of popsicle-sticks, and imagining that there is therefore popsicle-sticks moving things. The wavefunction is still not an observable physical thing. 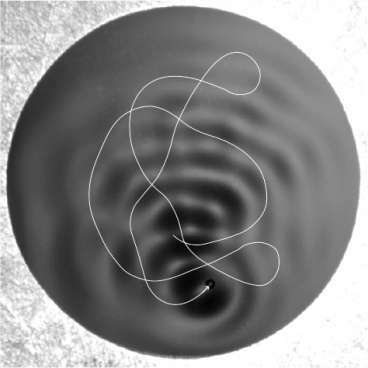 It seems that this is not the first pilot-wave system discovered….We could easily see something analogous in nature, such as a water bug moving ( on water surface), could create a co-moving water surface wave around ….. The wavefunction is still not an observable physical thing. So http://www.nature...F1.html, we already observed it directly? The trick is in the word "direct". Nope. They're using quantum tomography which merely reconstructs or graphs out the wave-function, based on measurements not of the wave-function itself, but of repeated (weak) measurements of the photon position (and) or momentum.